Improving your performance by running does not necessarily mean spending more time on the road or on the treadmill. Riding a bike or using a stationary bike helps you run faster by working on your muscles in a different way. When you combine running and biking during your training routine, you will notice positive changes in the speed of your runs due to an improvement in leg muscle strength and cardiovascular health, which are necessary for speed. A key complication with any running routine is the risk of injury during your recovery. When you run a long distance, your body and muscles may not be ready for a long distance run the next day. You need time to recover; however, you do not want to avoid all physical activity because it may contribute to injuries at a later time when you start running again. Biking provides a solution to this because you can ride a bicycle or a stationary bike during your recovery period without taking an unnecessary risk of injury. The exercise improves your blood flow, flushes out any toxins that build up, and reduces stiffness from your previous run. It allows you to work out the discomfort while also avoiding potential injuries. Along with the lower risk of injury during recovery, you also reduce the risk of injury from long runs. A long distance runner puts a large amount of strain on the physical body, particularly the knees, hips, and ankles. The motion combined with the impact on cement or other hard surfaces can result in injuries over time. Riding a bike is low-impact exercise that allows you to work on improving the strength of your heart. Effective runners must have a strong heart to keep blood flowing during a long-distance run. A longer cardio workout allows you to keep your heart strong and work on building up the muscles. Greater endurance and muscle strength occurs naturally when you combine biking with running. Since you can engage in longer cardiovascular workouts on a bicycle, you develop a greater level of endurance over time. The longer time on the bike helps you develop endurance in running because your heart and muscles can persists in the activity. The increase in muscle strength also improves your speed and endurance during a run because you work on different muscle groups. The key factor that helps during the run is that the muscle groups in biking complement the muscles you use for running, which improves your performance over time. 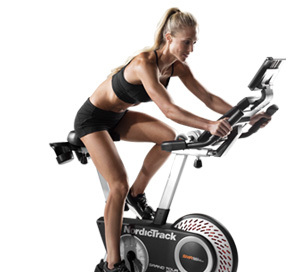 Cadence on a bike transfers easily to your cadence when you run. In both running and biking, you must maintain a steady and consistent motion with a smooth cadence. In the case of biking, you want to gradually increase the revolutions of both bike petals, or RPMs, to 70-90 RPM for your cadence. Start with an easy gear and reach the 90 RPM cadence. After reaching the speed, switch to a higher gear while maintaining the same cadence to intensify your ride. Biking easily transfers into a run, allowing you to combine both exercises in the same workout routine. Start on the bike and reach the preferred gear at 90 RPM and then start running immediately after getting off the bicycle while maintaining the same steady and smooth cadence in your step. You will find that it has a positive impact on your speed while also helping you improve your training routine. The key reason you want to add biking to your training routine is that you get the same results without the long-distance run that harms your knees, ankles, and hips. By transferring your cadence immediately from a bike to a run, you spike up your heart rate and you gain muscle strength. (Heart rate monitors used for exercise such as the wireless heart rate monitoring chest strap are not medical devices, and their accuracy may be affected by a number of factors. They are also not intended to diagnose, treat, cure, or prevent any disease). The process, which is called a brick workout, allows you to recover quickly after a workout and provides the same benefits as a long run. A brick workout is a process or routine that combines two different exercise disciplines into one cohesive strategy. It focuses on building muscle memory and neural pathways to help your body regulate pace and effort as you transition in between training sessions. The biggest challenge of a brick workout combining running and biking is the initial steps to reach your long-term goals for an exercise and workout routine. You do not want to start the process too quickly because it may cause injuries. Instead, you want to start slow and gradually build up to a routine with more biking, a reasonable amount of running and a long-term plan for adjusting the routine according to the needs of your body. A simple way to start slow is with a 10-minute bike ride followed by a 1-mile run. When riding a bike, focus on setting a hard or challenging pace. Try to reach 90 RPM and increase the gears if you find the cadence too easy. You can adjust the ratio of biking and running immediately after the first routine to further challenge your capabilities. If you find a brick workout difficult then try toning down the time until you feel comfortable with the change. You can easily cut the initial workouts in half, such as a 5-minute bike ride and a one-half mile run, to train your body in recognizing and adjusting to the different forms used in biking and running. Focus on transferring your cadence without harming your form or taking risks with your physical health. Riding a bike improves your performance as a runner by increasing your endurance, building up your muscles, and reducing the risk of injuries to your legs and hips. As you complete more brick workouts, you should notice a positive change in your running technique, speed, and ability to keep going during a marathon or long-distance running event.